Whatever manner of payment your customers choose to use, we can set you up to accommodate them. 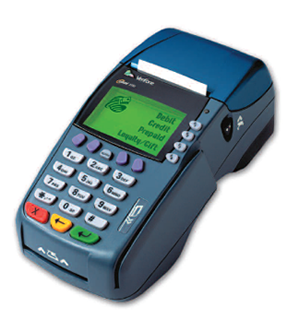 For your plastics, we work with all major credit/debit card companies and have equipment available for sale or lease. People have quickly grown to accept the use of cards as a routine payment method. Your customers demand a lot, and one of the things they expect from you is your ability to accept their plastics. We also offer the ability to approve paper checks, we can administer your own stored value card program, and we can even service Internet merchants. Give your customers the payment options they want. If you already have this service through another bank, you may be paying too much. American Community Bank offers the same capabilities, with more reliable service and the personal attention that our customers have grown to expect from us. And we promise a smooth transition from your current provider. Merchants not offering merchant services are potentially losing customers. Take advantage of this opportunity to simplify your transactions. It's a reasonable expense that requires minimal effort, and your customers will thank you for it. Let us get you set-up today! Contact us at (219) 365-6700 for details.